The following is the third and last in a series of videos that demonstrate how to use the spreadsheet tools that accompany my new in-depth (100+ page) article: Option Strategy Hedging & Risk Management: An In-Depth Article Introducing an Interactive Analytical Framework for Hedging Option Strategy Risk. The Kindle ($9.99) and Print ($14.99) versions are both available on Amazon. The following video demonstrates how to use the spreadsheet tools that accompanies my new article (Option Strategy Hedging & Risk Management) to identify the lowest-cost black-swan hedge using VIX call options and/or put options on the underlying security. 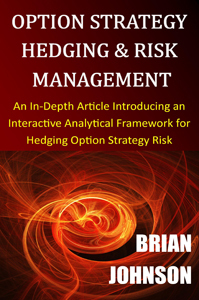 This entry was posted in Options, Recommended Reading, Risk Management, Video and tagged Brian Johnson, futures, Hedging, option strategy, Option Strategy Hedging & Risk Management, options, risk management, video. Bookmark the permalink.